Bond Economics: Whither The Bond Bear Market? Whither The Bond Bear Market? Financial markets are in disarray, with the Treasury market sell off generally being blamed. From my perspective, such events are the time where relative value opportunities pop up, and so are welcome from a portfolio management point of view. If nothing is going on, there's no juice for outperformance. However, people who are not involved in fixed income portfolio management might be more worried about the effect on the economy. Although it is in my interest to tell everyone that the Treasury market is finally exciting, I think we need to keep events in perspective. 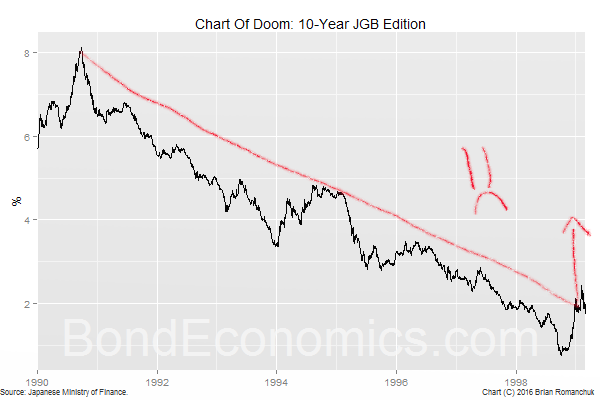 The first issue are the various "secular bond bull market is over, so therefore a secular bond bear market has started" charts. Even slight familiarity with recent financial history tells us that those charts are ridiculous. The figure above shows us a very similar event that happened in the Japanese Government Bond market. (Thanks to my daughter for helping with the chart annotation, she may have a bright future as a technical analyst!) As the click-bait headlines go, you won't believe what happened next! I cannot give investment advice, but it is clear that the bond market is in trouble if the post-Janet Yellen Federal Reserve reverts back to its historical form of "gradual" rate hikes: 25 basis points per meeting, eight meetings a year. What stops that? The potential for a recession. If you want to be a bond bull, you can take solace in the fact that this cycle is long in the tooth. The question, as always, is the following: what source of fixed investment will disappear as the result of the backup in interest rates? There is obviously a fair amount of malinvestment going on (cough, Bitcoin mining, cough), but it is unclear to me that this enough to derail the global business cycle. If I were marketing myself as a forecaster, I would dig into this, but that is not my objective. Although the tick up in average hourly earnings is a good sign, we still have to accept that there is a certain amount of noise in the data. Furthermore, rising wages might just eat into profit margins (making equities less attractive), and not necessarily drive higher output inflation. My bias is not to be worried about inflation, but if we look at past cycles (over the past couple of decades), it is clear that inflationary pressures do build slowly. It is very easy to come up with a story that the Federal Reserve needs to snug interest rates higher to keep these inflationary pressures capped. I would argue the secular bond bull market is due to the long term shift in wealth distribution (the wealthy have so much they don't know what to do with it) and until that changes, the long term trend will remain intact. The cyclical gyrations, however, relate to inflation/disinflation cycles. Given that inflation is creeping up, interest rates will follow. The wealth distribution is partly following the fall in interest rates - financial asset prices go up as discount rate falls; rich people own more financial assets, and so wealth inequality increases. I am unsure what is driving what. However, income inequality should definitely be a driver.